Bringing up Bella: Let the games begin! The "Social Media for Social Good Holiday Event" has started and you can be a part of it! How you would like to start the New Year by winning some cash for you AND your favorite animal charity? 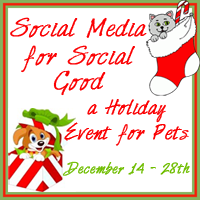 Two Little Cavaliers is giving a bunch of us pet bloggers and small businesses the opportunity to bring you a special social media holiday event. The winner of the event will receive $112 via Paypal for themselves as well as $213 sent directly to their favorite animal charity. And that winner could be you! Leave a comment below and tell me about your favorite charity. What 501(c)(3) organization would you donate the charitable portion of the prize money to if you win? "Like" any (or all!) of the Facebook pages of the bloggers and small businesses who are participating in the event. Already "Like" one of the pages? That's ok, just click the "+1 Do It!" button on the Rafflecopter widget and select "Enter". "Save A Sato is a non-profit, all volunteer organization dedicated to easing the suffering of Puerto Rico's homeless and abused animals. "Sato" is slang for street dog. We rescue Satos from the streets and beaches, give them medical care, food and shelter, and plenty of love. When they are healthy, we send them to one of our shelter partners for adoption into loving homes." They have an ambitious Mission Statement that includes everything from providing basic care like feeding and vaccination programs to legal advocacy and, most notably, "re-homing services" in which they partner with shelters on the mainland to be adopted into loving homes here. Conditions in Puerto Rico are rough for stray dogs and cats and the Save a Sato volunteers save lives every day with little money and even fewer resources. Every donation goes towards improving the conditions of the animals in their care. Remember each activity completed earns you an entry into the random raffle at the end of the event. So check out the blog hop to get started and don't forget to tell us what charity you're participating for in the comments section. Good luck!